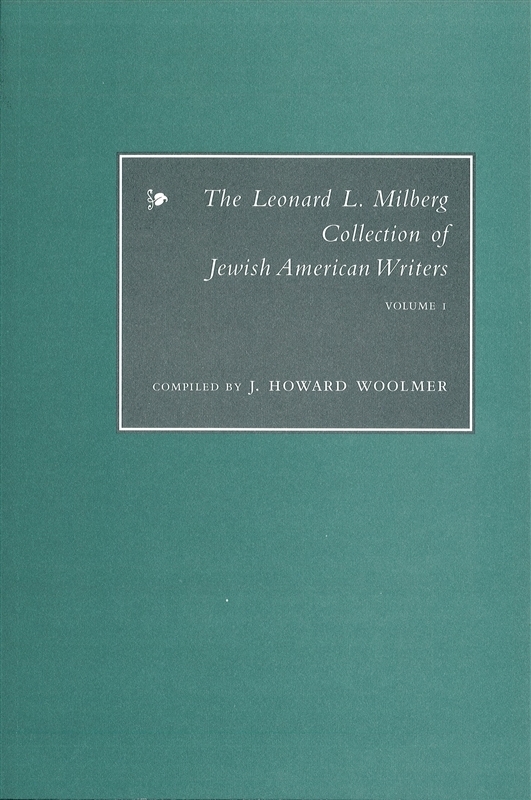 This catalog describes the collection of books by Jewish American Writers built for the Princeton Univ. Library by Leonard Milberg, beginning in 1999. The year 1800 was chosen as the date for the start of this collection, and it was decided that Princeton would collect all printed materials, incl. books, broadsides, and related materials. Each entry in the catalog gives the title, place, date of publication. 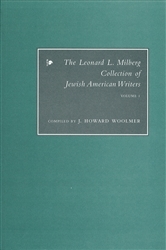 Yiddish titles have been transliterated. Vol. 1 includes: Woody Allen, Hannah Arendt, Sholem Asch, Saul Bellow, Harold Bloom, Joseph Brodsky, Jules Feiffer, Leslie Fiedler, Allen Ginsberg, Ben Hecht, George S. Kaufman, Alfred Kazin, Maxine Kumin, Tony Kushner, Emma Lazarus, Denise Levertov, Norman Mailer, Bernard Malamud, David Mamet, Arthur Miller, Clifford Odets, Alicia Ostriker, Grace Paley, Chaim Potok, Adrienne Rich, Budd Schulberg, Isaac Bashevis Singer, Art Spiegelman, and Nathaniel West. Photos.